This time we get a revealing example of the care and detail that goes into the making of props from the opening scenes of John Carpenter's The Fog. The moment in question comes when Father Malone (Hal Holbrook) has his night of solitary drinking interrupted by a loose piece of masonry, revealing an ancient leather-bound journal hidden within the walls of his church for a century. It's hard to make out everything, but the cursive script reveals two discernible phrases. Do they hint at the terror that will befall Antonio Bay and its residents? Do they make clear how the rotting dead can be appeased and made to halt their rampage? Or do they reveal the frustration of a member of the art department. Clearly it's a find of major archaeological significance. 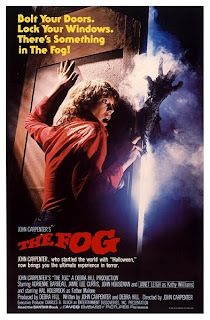 I wrote a review about the superior 1980 version of John Carpenter's The Fog on Amazon.com under the pen name TCM (for my initials, not Turner Classic movies BTW) and this little-known hidden inside-joke years ago. I always wanted to ask Director John Carpenter about this bizarre but hilarious enigma. One of the lines after the movie props sentence is “Lucky Me”. A fitting sarcastic ending to that paragraph.